A new study raises the intriguing possibility that drugs prescribed to lower cholesterol may be effective against macular degeneration, a blinding eye disease. 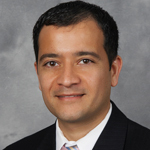 Researchers at Washington University School of Medicine in St. Louis have found that age-related macular degeneration, the leading cause of vision loss in Americans over 50, shares a common link with atherosclerosis. Both problems have the same underlying defect: the inability to remove a buildup of fat and cholesterol. 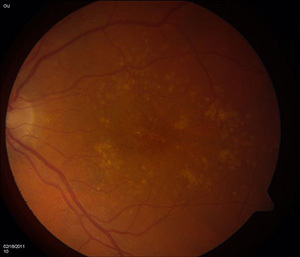 Beneath the retina of a patient with macular degeneration, the small light dots against the orange background are cholesterol deposits, and as cholesterol builds up, the area becomes inflamed, spurring the development of abnormal blood vessels that can lead to loss of vision. Working in mice and in human cells, the researchers shed new light on how deposits of cholesterol contribute to macular degeneration and atherosclerosis and even blood vessel growth in some types of cancer. Patients who have atherosclerosis often are prescribed medications to lower cholesterol and keep arteries clear. This study suggests that some of those same drugs could be evaluated in patients with macular degeneration. This is video of an examination of the retina of a patient with age-related macular degeneration. The light-colored flecks are cholesterol-rich deposits that have built up under the retina. Protect and save your vision Does reading in dim light hurt your eyes?